La Locanda del Moro” is a traditional Tuscany country house located on top of a sunny and very panoramic hill near the beautiful medieval borough of Sillico. 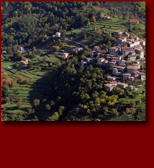 It rises on a terraced area surronded by grazing sheep and very ancient chestnust forests. The wonderful panorama, look the Garfagnana Valley, the Appennino National Park mountains and the beautiful Apuan Alps making this place a very enchanted one. “La Locanda del Moro” is a stone faced walls, completely restructured using a traditional Tuscan materials: handmade cotto tile, chestnuts wood and stones. From the swimming pool the guests can ejoy the peace and the sourrounding mountains with the necessary privacy and comforts for a special and relaxing holiday. “La Locanda del Moro” offers to the guests unique dishes taken from the Tuscany and Garfanana taditional kitchen using local ingredients only. Under the beautiful veranda in summer or in front of a big fire place in winter, it is possible to taste farro soup, home made pasta, local meet, muschrooms, “salame” and “pecorino” cheese with honey or home made jams, the italian pizza cooked in the traditional fire wood oven, tasting very special olive oil, italian wine, grappa or traditional “nocino”, home made cakes, biscuits and more. 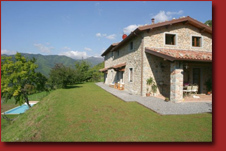 “La Locanda del Moro” is a perfect palce where come back after an interesting visit of the historical cities of Lucca, Pisa and Florence, a very comfortable starting point to discover the beautiful corners of the Garfagnana valley by walking, horse riding, bike riding or simply by car. Very expert guides offer to the guests the possibility to enjoy the Garfagnana wild nature with trekking, mountain bike, speleology and canyoning excursions. An holiday at “La Locanda del Moro” will be an unforgettable experience for your five senses. Welcome where the Tuscany meets the sky. Thanks for your visit, remember you to sign the guestbook.